Earth has been invaded by an alien race called The Mimics. They landed in Germany and have so far occupied all of Europe. An allied army of humans from all across the world have suited up in special mechanized armor to fight the enemy. Tom Cruise is Major William Cage of the US Army. He‘s a weak-kneed talking head in public relations that has never seen a day of combat in his life. General Brigham (Brendan Gleeson), leader of the United Defense Force, orders Cage to accompany the initial wave of Allied troops in France on the front lines. Cage balks at the order and responds with a veiled threat that only gets him in hot water. General Brigham’s guards taser the major and he wakes up in a military base at Heathrow airport. There he meets Master Sergeant Farell, Bill Paxton in a role he inhabits well. Cage has been demoted from an Officer to Private with a fake history. He’s been labeled a deserter. He is placed with a ragtag squadron of recruits set to invade the French Coast where they will launch a surprise attack on the Mimics. Here’s where Edge of Tomorrow gets interesting. The battle doesn’t go well and he dies. It’s a moment he will relive again and again every single day as he is caught in a time loop back to the point where he wakes up at Heathrow. For months wags have been calling Tom Cruise’s new sci-fi offering “Groundhog Day-meets-Starship Troopers”. I hesitate to even mention that dismissive summary because it’s so flippant. In truth, the assessment is precisely accurate but it also unintentionally minimizes a very imaginative script. The movie takes the concept and really runs with it. There is a real excitement watching Tom Cruise. Sweating profusely, he seems genuinely scared, being dangled with the rest of his squadron from a plane than plans to parachute into a combat zone in France. They wear weaponized suits that looks like metal exoskeletons to assist them in the fight. Think Ellen Ripley in Aliens. He’s skillfully supported by Emily Blunt. She plays a Special Forces Soldier he meets in the fray named Sgt. Rita Vrataski. Having been credited with hundreds of Mimic kills, she becomes an aid in helping him harness his special ability for good. Whenever they‘re injured and unable to continue, she has to kill him to start anew. It’s kind of like a real life reset button. There is an excellent balance of intense adventure and lighthearted humor as well. The first half makes extraordinary use of its head trip idea. Despite the fact that he can keep starting over, we are invested in his mission. Unfortunately the climax forgoes the established concept. The speedy sci-fi at the beginning devolves into a generic action film. It’s tolerable. However a fundamental distinction that made the narrative innovative is replaced by developments that are comparatively underwhelming. The standard issue finale just can’t quite live up to the inspiration of the set up. Yes, I’m being vague. I don’t ruin movies. 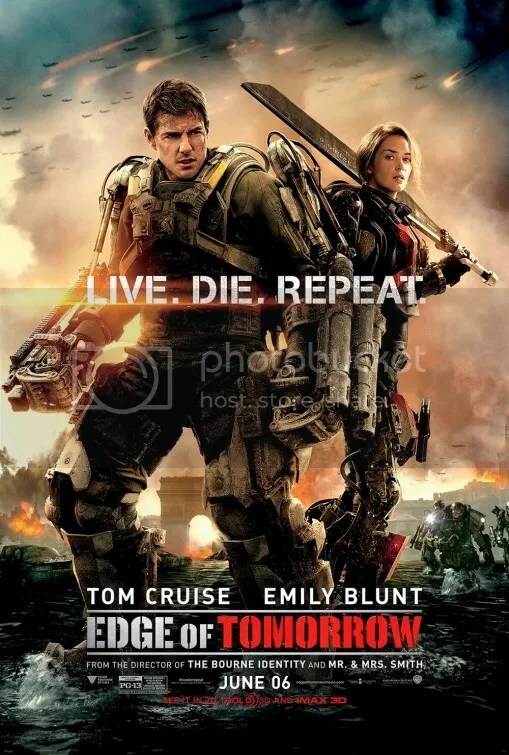 Edge of Tomorrow excels when Officer William Cage manipulates his abilities to serve a laudable purpose. Over time we see the lead learn how to make use of his gift for the greater good. There is a genuine character arc where our protagonist grows from a cowardly sneak to a reluctant hero. There is some extremely brilliant editing in the first half. The sequences repeat continuously so that he can extract the best possible outcome. The results are funny but they’re also validating because they build character. Watching the same vignette play out repeatedly might seem monotonous, but it never feels that way. The execution is surprisingly captivating because it combines thrills with levity. Practice makes perfect. The second part eschews the basic premise. That’s where the dizzying sci-fi succumbs to generic formula. It’s a regrettable misstep in an otherwise entertaining watch. This entry was posted on June 6, 2014 at 10:15 pm and is filed under Action, Science Fiction with tags 2014. You can follow any responses to this entry through the RSS 2.0 feed. You can leave a response, or trackback from your own site. Great review. I was not expecting to enjoy this but the concept actually really works. I agree that the end is less compelling than the start though. I wasn’t looking forward to it either, especially after Oblivion. Then I remembered Minority Report and War of the Worlds. Tom Cruise and sci-fi go together even better than I thought. I enjoyed this much more than expected as well! Got to love when a film does that. Doug Liman is a pretty consistent director. The ending’s a bit of a cop-out, but honestly, it didn’t bother me as much because I was too busy just enjoying myself here. Good review Mark. I still enjoyed the film quite a bit but I left the theater feeling like they cheated. Your thoughts are bound to match up with someone else out there. There are just too many critics. But I know what you mean. I try to abstain from reading reviews until I’ve written my own because it does make it harder to be original. Star Wars huh? That’s one comparison I haven’t heard yet. Yeah it’s a good movie. Too bad it flopped. With the great word of mouth it should hold well but there is no way it is going to meet expectations and that’s a shame. Well it cost $178 million to make. There’s no way this will earn even half that. Gee, they take off all the OBVIOUS United States Marine Corps Insignia off his uniform in exchange for United Defense Force Insignia, and he gets confused for a United States Army Officer? I can’t even remember the last time Tom Cruise played a “soldier”. He’s always either portrayed a Sailor (Top Gun, A Few Good Men), or a Marine (Born on the Fourth of July). Those, and Private Military or Police (Minority Report, Oblivion). Even though he was technically an officer in the United States Army, he was really more a public relations speaker. Wasn’t he a former soldier in Jack Reacher? Valkyrie? He says he’s “Major Cage, US Army Media Relations”, with no qualifiers whether he’s “in” or “with” said organization of the US Army. Just like US Navy Corpsmen can be “in” a US Marine Corps unit without actually being a Marine themselves, so can a Marine be with an Army organization without being a Soldier (big “S”, not generic “soldier” as used in common conversation to refer to service-members regardless of branch affiliation) in a Time of War. Nevertheless he does wear a USMC Officer’s Uniform, which makes his depicted aversion to combat being “ROTC when the war broke” all the more jarring. All Marines, regardless of specialty, get significant Ground Combat Training. If he was an ROTC Cadet during the invasion it would have been Navy ROTC. It then would have made more sense for him to be portrayed as a US Navy Lieutenant Commander working in Media Relations, aversion to ground combat and all. I didn’t see both Jack Reacher and Valkyrie but I wasn’t counting “former service or foreign military affiliations” either. Agreed Mark, not a huge fan of the ending myself but up until that point it’s a smart and highly entertaining sci-fi thriller! Excellent review mate. Yeah I enjoyed it. It’s just frustrating because this was two-thirds of a perfect film. First off, great review Mark as always! It’s been about 3 hours since I walked out of the cinema. I watched it at my local IMAX. I’m still not entirely sure how i feel about it overall. I had a really good time with this film and was thoroughly engrossed and just having a flat out good time. I agree with you completely – “GroundHog day crossed with ” statements really do this film a disservice. I have to hand it to Tom Cruise, he does pick his sci-fi projects well. They’re always well directed, look gorgeous and have a strong premise. It seems odd that his most recent high quality efforts have not been rewarded in kind at the box office. Audience fatigue after the whole bad press moments? Who knows…. But what I DO KNOW, is that he would be better served my making BOLDER decisions with the endings of his films!! Lord almighty! Has he got a contractual obligation or something to end these films on such a happy “tidy” note?? Also, what is it with these half-arsed love stories in these films? The moment Tom & Emily started conversing as they were driving through the French countryside (a terribly judged segment of the film in my opinion) the cynical critic in me woke up and started ringing his alarm bell. I just knew that somehow, by hook or by crook – the would figure out a happy ending. Against my better judgement, I actually momentarily believed they would drop it, certainly after their “farewell kiss” conversation when they were in the belly of the beast. But no – the path they chose didn’t even make sense!! I thought the overlord was kaput? Or does the blood have a life of its own? Does the blood choose where you “reset” to? How did it exert influence over time to arrive at a point BEFORE any of the events occured and still be dead? When the characters were made mortal again, the movie had regained its momentum – perhaps a sacrificial act, saving Emily while being martyred…anything but what they chose! All in all, I think it’s Tom’s best sci-fi film since Minority Report, I would say this comes close to that, different types of film I know, it was certainly the most fun I’ve had in his films in a while. We are completely in agreement. I really wish the screenwriters had the courage to follow through on their own premise. The day shouldn’t have reset. Cage lost this ability when he got the blood transfusion. The movie is very clear in this as it reiterates the point several times throughout the film. Oh but we can’t have Tom die!! Instead we get the typical Hollywood ending that not only saves Cage but Rita as well. If that wasn’t enough, Cage inexplicably wakes up at an earlier point than the previous reset to find out that the war has now been won by mankind. I suppose it would be asking too much to expect both main characters to die but that is the only scenario that would’ve made sense. Here was an ending that reeked of studio interference. It doesn’t follow the much more coherent source material, the Japanese novel by Hiroshi Sakurazaka called All You Need is Kill (which is an awesomely better title as well). the second half sounds disappointing, which is hard for me to understand since the book is sooooooooo good and more nuanced than it’s given credit for. Yes the movie differs quite a bit from the book. While watching this movie, I was really enjoying this a lot. It was exciting, funny, and well acted. I didn’t connect the flaws, while watching, I just enjoyed it all. It was fun. It wasn’t till discussing it that I realized the major flaw at the end. I still enjoyed it anyway. 3 1/2stars. The way they retrofitted the premise to suit a desired outcome was unfortunate, but I still had a lot of fun. Good review. I thought this looked generic on the ads. Your review confirms it for me. I’m sure this isn’t terrible, but it just seems predictable and cliche. It’s probably worth watching on TV someday, though. I loved the film. The overall gist of my review was very positive: “real excitement”, “excellent balance of intense adventure and lighthearted humor“. Only the ending was generic in an otherwise entertaining watch. I think the key to a successful final act of an action film or thriller is to have the protagonist face an intriguing villain; like Joker, Bane or Predator (from the first one). Single villains are far more intriguing than a million aliens (or whatever) flying around in the sky like in “Cowboys & Aliens”. Quality over Quantity. I felt the same way. I now realize the marketing/trailers didn’t convey how different this film really was. People thought it was just another sci-fi offering like Oblivion or Elysium. It was so much better. The marketing was just awful. Somebody should be fired for that. Emily Blunt is so good in this. She got more acclaim for her role in Into the Woods, but this was the 2014 performance that should have garnered the praise. And again we agree, as we so often do. A genius set up, tremendous editing and excellent performances. But also an anti-climactic finale. The finale bugged me, but not so much because it was dull. More because it didn’t show any courage. If the narrative is going to make it a point to feed us precedent, then the least the filmmakers could do is to follow those fundamentals. I think I know what you mean (and we’re both being vague so as to avoid spoilers). And I think I totally agree. I’d echo your sentiments about EDGE OF TOMORROW. The ending did lack some punch for me as well. I tried to veer away from spoilers in my review as well. For me the best part of the movie was watching the arc of Tom Cruise’s character. He’s a really unlikable guy in the beginning, so watching him shape up and earn your respect is very satisfying. He was cast against type there in the beginning. I liked that.